As the bus pulled away from Victoria Coach Station in London, I kept reassuring myself that Edinburgh wouldn’t be too bad by myself. You see the girls who I was traveling with weren’t on the bus with me. They had all gone to see the play “Wicked,” while I had chosen to roam the British Museum instead of springing for pricey play tickets. We had agreed to meet at Victoria Coach station before our 11 P.M. overnight bus left for Edinburgh. But when they hadn’t arrived by 10:40 pm, I made the decision to board alone. I had to assume they’d make it; after all, they were all upper classmen, older than me. Surely they wouldn’t miss the bus and abandon me to see Scotland alone. During those first six hours on that bus I worried more than I think I did the rest of the month. Much to my relief, one of the girls found me at the second stop of the trip to inform me that they had all made it on another bus. We all arrived safely in Edinburgh at 8 A.M. Saturday morning. Although tired from the bus ride, we were definitely ready to see the city. Our first stop was Edinburgh Castle, which wasn’t hard to find. The fact that the Castle sits in the middle of the city, on a mountain, certainly contributed to our ease in finding it. It was well worth the price of admission, if only for the view of the city and bay. Add in a free tour, living history experiences, and the crown jewels of Scotland, and you have a fun filled, relatively cheap day. After we left the castle, we wandered around Edinburgh for what was left of the afternoon. We didn’t stay out too late that Saturday night, because after the long trip on the bus the night before, we were all pretty tired. 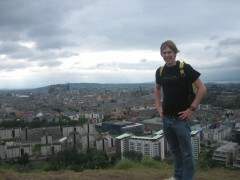 The next day, after attending church at one of the cities oldest cathedrals, I hiked in the hills near the middle of the city while the girls went shopping in some of Edinburgh’s many stores. It’s too bad we don’t have green spaces like the Scot’s enjoy in Abilene, of course that would require hills. The spectacular view from the top of the hills was one of the reasons my trip to Edinburgh was my favorite part of the United Kingdom. 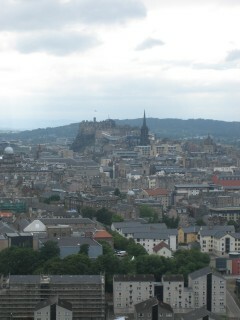 I could see the bay blending into the North Sea, as well as the entirety of the City of Edinburgh. That view was the best view I had on my entire trip. I had to tear myself away from the view in order to meet the girls in the city center so we could travel—worry free this time, and together– back to Oxford Although it was another long night on a bus, at least I was traveling with people I knew. Our adventure didn’t end at the London bus station. We had class at 8:30 that morning, and only an hour and a half to make it back to Oxford. We hurriedly bought our train tickets, as well as our tube passes, and ran through several train stations in order to catch the 7:20 train to Oxford. Once we made it to Oxford, we caught a taxi back to the house and walked in five minutes before class was due to start. It was a weekend in Scotland that I will remember for many years to come.